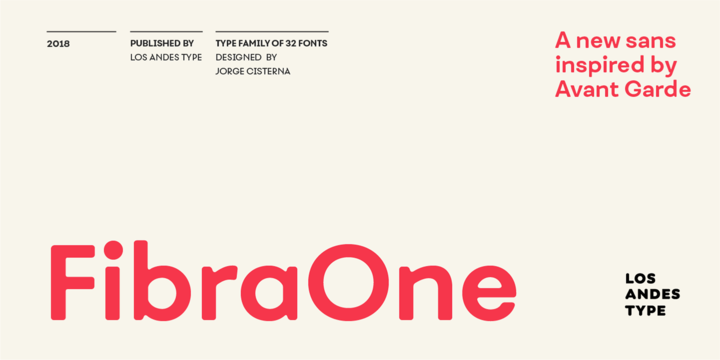 Fibra One is a geometric sans serif typeface created by Jorge Cisterna and published by Los Andes which is the soft version of the Fibra font. Inspired by Avant Harde font, it is available in 32 styles, 2 widths (Normal & Alternates) each with 8 weights (from Thin to Heavy) and their italics. It keeps the contrast between curves and straight lines in some characters and it pay attentions to details of display characters. It was designed to be suitable for display use. Also can be use for magazine, headline, poster, logotype etc. Have fun! Price: starting from $26,00 for one font to $199,00 for all 32 fonts. A font description published on Monday, January 29th, 2018 in Fonts, Jorge Cisterna, Los Andes by Alexandra that has 2,480 views.